I’ve been really into natural and mineral cosmetics, my favorite of which are eye shadows. I love to play up my baby blues! But I have two main complaints with mineral eye shadows. 1. Loose powders are SO messy. and small pots that usually hold eye shadows make it even more of a hazard! 2. The colors are often boring. So, when someone mentioned to me Honeybee Gardens, I was instantly a fan. 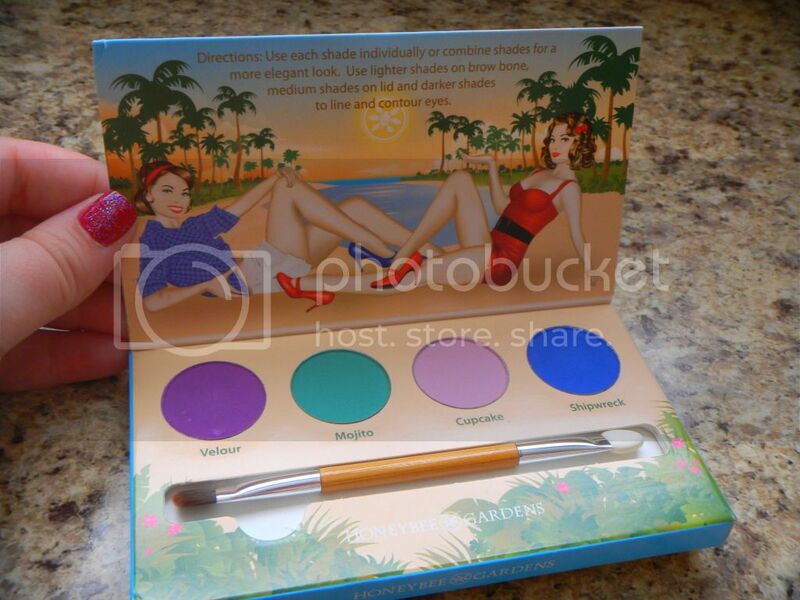 The palette has a cute “beachy” retro vibe to it. This palette features 4 pressed eyeshadows inside a light weight paper palette. They chose to go with paper so that the materials used could be easily recycled. While I understand the importance of recycling, I do wish the palette itself was more sturdy. 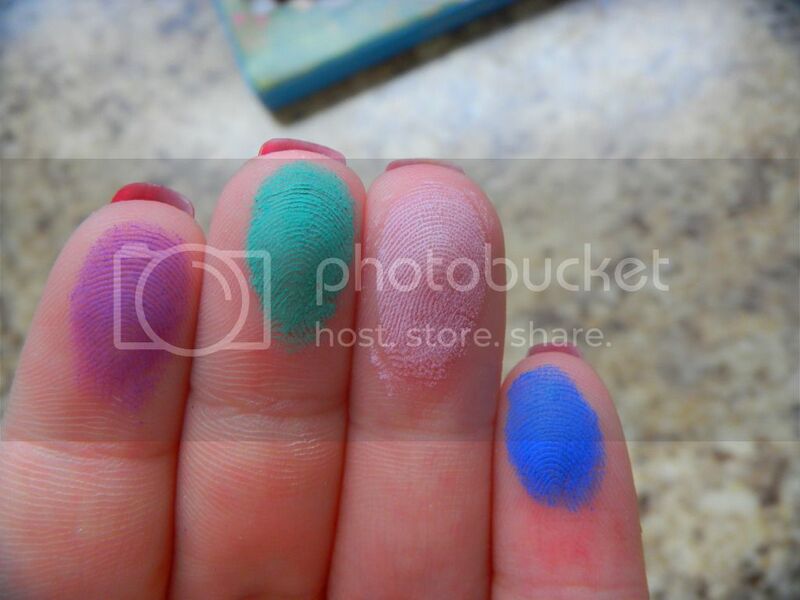 There are 4 colors in this palette: (left to right) Velour, Mojito, Cupcake & Shipwreck. LOVE the names and these colors are so bold! All of these colors apply smooth and have wonderful color pay off. I can’t even pick a favorite! 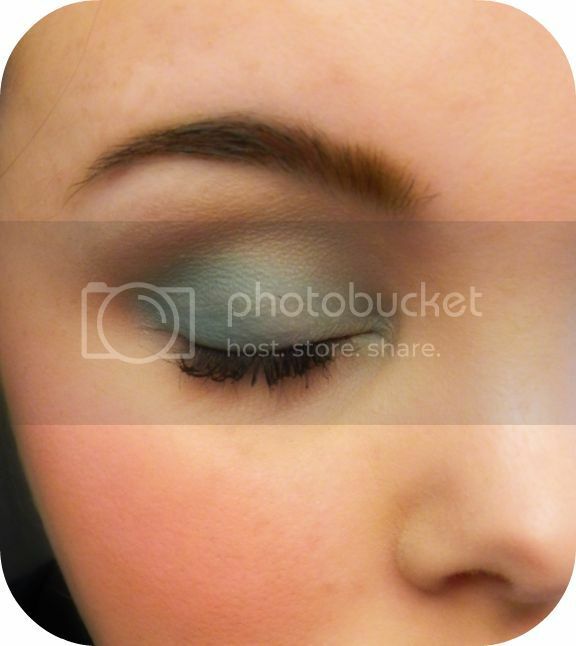 This entry was posted in Cosmetics and tagged blue, cosmetics, cupcake, eye shadow, eyeshadows, gardens, green, highlight, honeybee, mineral, mojito, natural, pink, purple, recyclable, Review, shipwreck, velure.